Geeky Star Wars fans dress up their girlfriends like this. True Star Wars fans prefer to put themselves in Leia’s place. Despite my previous piece on the literary and artistic value of games, I’d like to make it perfectly clear that the deeper meaning many artists put into their work does no more than ask, “Do you want to super-size it?” That statement alone reveals the corporate world’s fetish for up-selling, as they used to ask, “Do you want fries with that,” right up to the point when they realized everyone always bought fries already, so why not try to sell us bigger fries? Andy Warhol realized that he couldn’t tell the difference between art and advertising, so he gave us a painting of a Campbell’s Soup can, which everyone treats as a cute novelty without actually understanding his point. And so we get to video games based on movies; those of you my age might laugh as you remember such debacles as “Last Action Hero,” “Beethoven,” or “Home Alone.” More recently, we’ve had to suffer through Harry Potter games and an entire Lord of the Rings trilogy. I fully expect a Hobbit: Desolation of Smaug movie to capitalize on the lousier points of the film and give us long sequences where we can have Legolas use every tree stump, barrel, ax blade and goblin as a snowboard. It may look innocuous, but this level will make your hair fall out. Still, in the feeding frenzy of capitalism surrounding us, a few games actually make me stand up and proudly admit, “Meh. Not too bad,” and most of these games belong to the Star Wars franchise. Don’t ask me why. After announcing that N*Sync would guest star in Attack of the Clones, I nearly swore off Lucasfilm entirely, but since they backpedaled on that decision to avoid the Force turning angrily against them, I have to admit that George Lucas doesn’t always make crash-and-burn decisions. Let’s face it, though; if nothing else, Lucas’ studios have consistently pulled of effects and spectacles well, and in run-and-gun action games like Super Star Wars, you don’t really need much else. Note: We need Chewie’s lines. This completely changes the meaning of the story. The three games that make up the Super Star Wars series (Super Star Wars, Super The Empire Strikes Back, and the aptly named Super Weekend at Bernies 3; Return of the Bernie) recount the story of Luke Skywalker’s journey to become a Jedi and save the galaxy. They do this mostly through cut scenes in between levels, more as a side-story, like a salad to a run-and-gun platforming entree. Also, they included gameplay. The gameplay lets players romp merrily through said galaxy killing things that usually have no relation to the movies. But hey…lightsabers. Doesn’t really need much else. 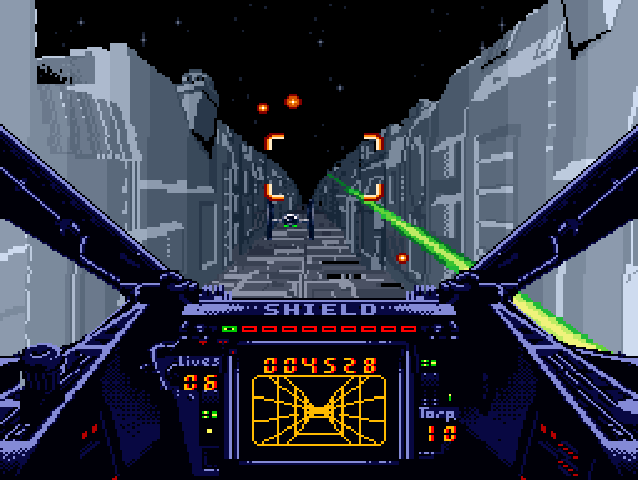 The first game opens with the familiar scene of Darth Vader capturing Leia’s ship and the droids ejecting toward the planet Tatooine. From their, we switch to the not-as-familiar scene of Luke dashing through the desert with a blaster as though he swore revenge on it for killing his mom. The first stage ends with the explosive death of the Sarlac Pit, thus rendering the climax of act I of Super Return of the Jedi completely nonsensical. From there, he sets off on a quest to liberate C3-PO, a droid he’s never met before, by killing his way through the entire population of jawas that he and his uncle depend upon to do business. I don’t know, Luke. Why would imperial stormtroopers want to slaughter jawas? Once you’ve accomplished that task, relax, get yourself a snack, and use the bathroom because you’ve got about two and three quarters of a game left of these I personally enjoy the way they reworked Luke surrendering to Vader in Jedi as an epic battle through the forests of Endor, followed by a hack-and-slash run through the Death Star before he finds Vader and the Emperor. Drive along a Northern Michigan highway at night in the winter, then switch on your brights. Seriously; it looks just like this. But before you consign the cartridge you bought in exchange for handful of pennies and that shiny bottle cap to the ebay scrap heap, give it a run. 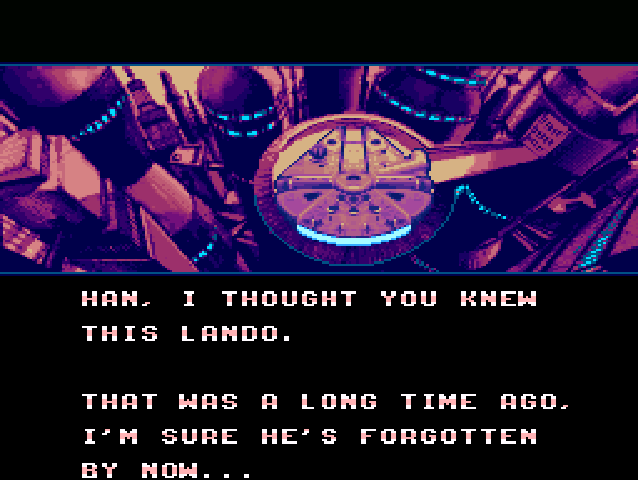 LucasArts kept the nonsense to a minimum, really, and certain game elements follow a modicum of logic. Luke begins with a blaster and gets the lightsaber when he meets Ben Kenobi. He can switch between them from that point on, but the blaster deals more damage, so the game at least nudges you to follow the progression of Luke’s training. The lightsaber doesn’t become a reasonably powerful weapon until Luke lands on Dagobah in Empire, although it does deal a fair amount of damage to wampas. By Jedi, Luke loses the ability to use a blaster altogether. On Dagobah, he can learn special Force abilities by collecting hidden power-ups, but if you don’t find them, you have to finish the duration of Empire without those abilities. Generally, though, using the Force causes more problems than it solves thanks to the clunky control scheme. For example, one skill lets the player toss the lightsaber and steer it around the screen to hit enemies. I might even enjoy that if I didn’t have to completely relinquish control of Luke, leaving him standing like a Tauntaun staring in the headlights of an oncoming AT-AT. The levitate ability helped me stay out of holes, (a pesky element from the platforming genre, who like a drunken uncle at a Thanksgiving dinner only made it in because someone felt the need to include everyone in the family) but I primarily stuck with the heal ability throughout the game. They mumble this guy’s name only once in a loud action scene, but somehow we all know Boba Fett. We have a Boba Fetish. 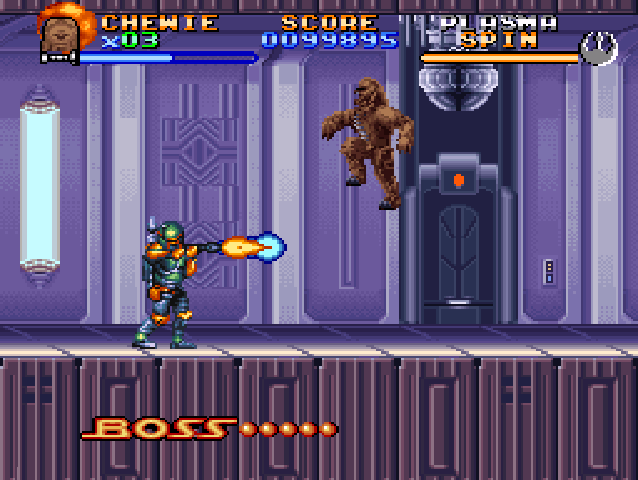 Chewie and Han each have small tweaks to balance out their power with Luke’s, although their default level-2 blaster disappears for the third game, making them somewhat underpowered. In Jedi, Wicket becomes a playable character, as do Leia in three different costumes, although compared to the other characters, she doesn’t have much to offer, and she usually fades into the background of the other characters, except for the fight with Jabba. 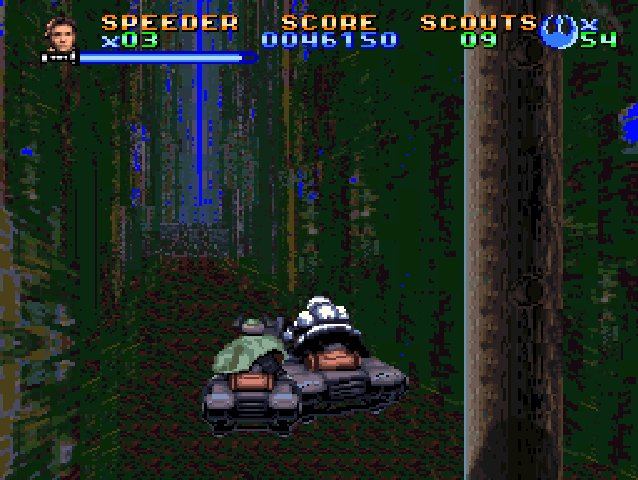 I know I’ve gone lightly on the side-scrolling screenshots, but the games go for an interesting variety with the vehicle levels. I really don’t have much to say about these games individually. They didn’t exactly innovate much as they released these over the course of three years. Even with minor differences between them, they could play as the same game. However, they do score points for creativity in their 3D vehicle levels. While many play out similarly, each one feels like driving a different Star Wars ship (even sometimes when different levels use the same vehicle). 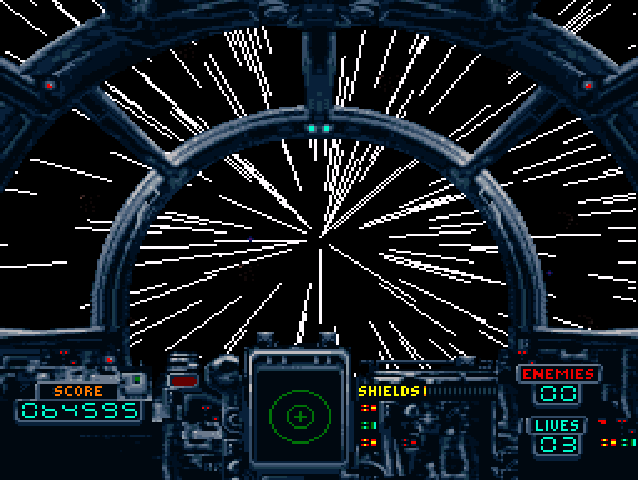 The player has a chance to drive Luke’s speeder, the X-Wing fighter, Snow Speeders, and the Millenium Falcon, each one in a unique level that, for the most part, resemble the movies with a degree of accuracy better than…uh…with a degree of accuracy. Fortunately, these games play well, and despite only mildly acknowledging that they should bear a resemblance to the movie, it gives the player a Star Warsey feel to it. Worth playing, even for a movie tie-in game, but at least they didn’t base it off a commercial…or make it into a commercial. Speaking of which, look out for a Plants vs Zombies II article. I know it doesn’t qualify as retro, but I have important things to say. May the Force not bend your NES connector pins out of place. This entry was posted in SNES, Star Wars and tagged SNES, Star Wars. Bookmark the permalink.